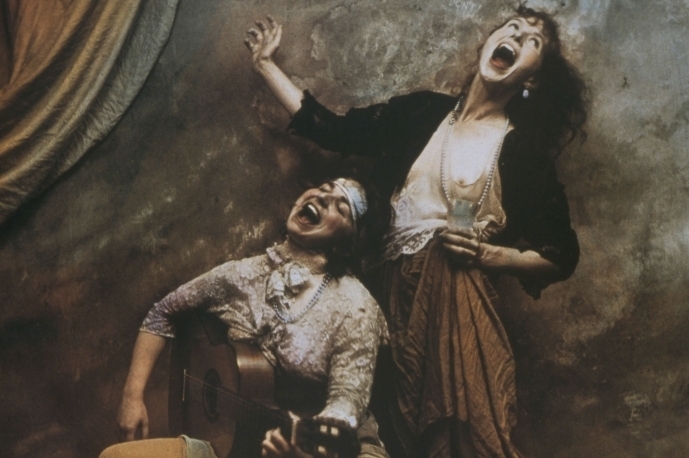 The work of the Czech photographer Jan Saudek (born 1935) is always about people. It is people who intrigue, fascinate and move him. His inspiration comes from deep down inside: ´Art is born in the soul´, he once said. The nature of his work is intimate and personal, revealing his own desires, fantasies, loves and anxieties. It shows his obsessive fears like the fleeting force of desire, the body´s ageing and disintegration, the loss of beauty or the ambiguous nature of the sexes. 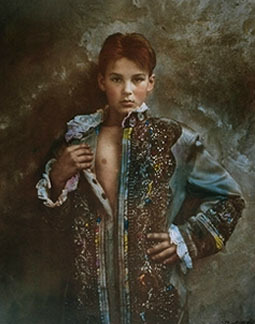 Generally it is Saudek´s family and friends who pose for him, but he occasionally poses himself. Saudek´s photography is fictional and theatrical, never shot in real-life situations, but always in some sort of timeless setting. Its abundance of pedestals, draperies, flower garlands, antique accessories and clothes gives the images a typical baroque form. This is not the only way in which Saudek detaches his photographs from the present. He also experiments with diverse techniques, like colouring all his photographs. This colouring accentuates both the anachronistic character and the pictoral aspect of his work.